It's all about the timing. Konami has released a new trailer for its forthcoming 3DS adventure Castlevania: Lords of Shadow - Mirror of Fate - and guess what? Today is Halloween. What a spooky coincidence. The new trailer showcases the game's combination of whip-based action and platform exploration, and long-time fans of the series will want to watch right until the end, where Dracula utters a line made famous by another beloved installment in the series. No prizes for guessing which one. 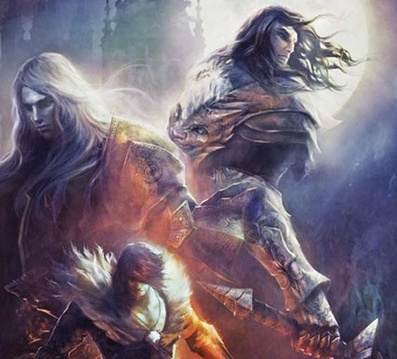 Castlevania: Lords of Shadow - Mirror of Fate is due out next year. You can read our early impressions here. I've never actually played a Castlevania game, but this looks pretty dang good. Enough trailers! HAVE AT YOU! never played castlevania, but this looks amazing! hope its not too hard but still enough of a challaenge. now imagine a 2D-metroid with these 3D-graphics for 3DS!!! that would be a nintendorgasm! Never played any castlevania either.. and I'm on the fence with this one, but I will keep my eye on it. Portable Castlevania never be the same again, it's just a reboot like the whole Lords of Shadow. It will be good because they keep a little from the 2D adventure, but I doubt it will be as deep as the previous ones on the GBA/DS. Hope I'll be wrong though. I don't know if 20 hours will be enough, I guess it depends on the content. Never played castlevania thats crazy people. Your missing out on one of the best series ever, stop what you are doing and go get a copy of castlevania 1 for nes, gba or vitual console its platforming at its best. That is a great trailer. Why are people complaining? It looks like an improved version of the DS games. So sad this was delayed, but if it's for polish, that's great. Can't wait to rock this one on my 3DS. I'll probably be buying this when it comes out. I love Castlevania and this looks great, so it's definitely a day one buy for me. looking to get it. never played one before but that rocks. I have bought all of the GBA and DS Castlevania games and loved them. So....this one here....is a must buy for me. I think those who are complaining know the original series. But again I'm not complain I just don't understand why was a reboot necessary...but it can be a good game, it has the potential. @XCWarrior Don't get me wrong i really like the trailer but the biggest problem for me is how long it takes to kill a single enemy. That may work in a 3d castlevania or devil may cry style of game but in a side scrolling platform game i think it will get annoying. The graphics look awesome to, but thats not enough its not gonna be as a good as the ds titles or symphony of the night or even super castlevania 4 which is a shame. That voice actor sounds just like Robert Carlyle (because it is)! I've heard it's a mix of the two types of CV games. I hope it leans more original, as I've had my fill of Metroidvania. I highly doubt the 20 hour story. Looks awesome though. Love the nod to SotN at the end of the trailer. I need to try this one first. Not sure if I want to buy this. And 'only' 20 Hours? That's pretty damn long for a Castlevania game....If you've mastered the previous traditional castlevania games they would take you maybe 2 hours to 3 at the most depending on the title to complete. I just don't understand why you should kill most of the enemies in a certain way. I think it can be boring after a while because of the re-appearing of the enemies. It seems Castlevania became one of the ruined franchise as well. Where are Circle of the moon, harmony of dissonance, aria of sorrow, dawn of sorrow, portrait of ruin and order of ecclesia?? Lords of shadow is just a gow clone, wasn't bad but they could give any name except for Castlevania. For me personally It will never top super castlevania IV or Rondo of blood, but since it isn't another metroidvania and I'm apparently one of the few who actually enjoyed Lords of Shadow, I'm really excited to get this one! @27 as much as I loved those previous handheld Castlevania games you mentioned, Konami needed to change it up because without enough updates to the Metroidvania formula, it gets boring fast. I liked the GoW games so let's see how it turns out before anyone declares Castlevania a "ruined" franchise. I think you misunderstood me. It is already ruined a bit, not as much as Silent Hill. But Lords of Shadow is not real Castlevania for me. And Mirror of fate picked up the storyline from Lords of Shadow era, which is not a problem on a "big" console. But it's a handheld, I want more of the previous ones...that's all. Yeah I am passing on this one, looks too generic. Secondly I've found the way the developers present themselves is too smug and arrogant.